Colloid and Interface Chemistry for Water Quality Control provides basic but essential knowledge of colloid and interface science for water and wastewater treatment. Divided into two sections, chapters 1 to 8 presents colloid chemistry including simple history and basic concepts, diffusion and Brown Motion, sedimentation, osmotic pressure, optical properties, rheology properties, electric properties, emulsion, foam and gel, and so on; chapters 9 to provides interface chemistry theories including the surface of liquid, the surface of solution, and the surface of solid. This valuable book is the only one that presents colloid and interface chemistry from the water quality control perspective. This book was written for graduate students in the area of water treatment and environmental engineering, and it could be used as the reference for researchers and engineers in the same area. Graduate students, researchers, and engineers who are working on water supply and drainage, environmental science and environmental engineering. It also can be used as a reference book by graduate students majoring in chemical engineering, biosystems engineering, or physical chemistry. Prof. Qing Chang was born in 1947 and graduated from Research Center for Eco-Environmental Sciences, Chinese Academy of Sciences in 1983, and his major is environmental chemistry. Prof. Qing Chang is currently a professor in the School of Environmental and Municipal Engineering at Lanzhou Jiaotong University of China. He is also a Member of Expert Panel of National Natural Science Foundation of China. He was a Member of Council of Chemical Society of Gansu province of China from 1990 to 2000 and a Member of Expert Panel of China National High-tech R&D Program (863 Program) from 2000 to 2004. 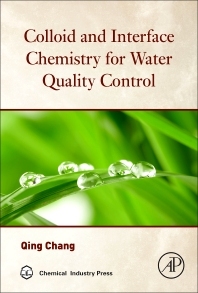 Professor Chang’s major areas of interest are water environmental science, materials and methods for water treatment, coagulation and flocculation and adsorption. He has taught colloid and interface chemistry for 20 years. He has been active over 40 years in his field and completed various research projects. He has authored over 100 papers published in peer-reviewed journals and six books published in China presses. He was also awarded three prizes by the government of Gansu Province for his contribution to science and technology development program.